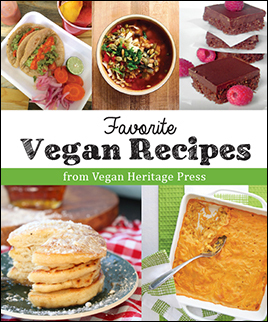 VeganHeritagePress, LLC (“We”) operate http://www.veganheritagepress.com (the “Site”). We are committed to protecting and respecting your privacy. This Site collects only basic contact data from its users, never personal data. While using our Site, we may ask you to provide us with certain personally identifiable information that can be used to contact or identify you. Personally identifiable information may include, but is not limited to name, email address, cookies, or usage data. Like many site operators, we may collect information that your browser sends whenever you visit our Site. This Log Data, collected by third party services such as Google Analytics, may include information such as your computer’s Internet Protocol (“IP”) address, browser type, browser version, the pages of our Site that you visit, the time and date of your visit, the time spent on those pages and other statistics. Some of third parties such as for example Google Analytics and MailChimp collect statistics in an anonymized and aggregated form and may not require the consent of the user or may be managed directly by us without the help of third parties. These may be used to track users’ browsing habits – in addition to the information specified herein and without our knowledge. Please refer to the privacy policies of the listed services (Google Analytics and MailChimp) for detailed information. We may process personal data relating to users who have given their consent for one or more specific purposes. We process and store your contact information for as long as required for the purpose they have been collected for, namely for promoting our information to you, as long as your consent is not withdrawn. We do not specifically market to or collect information on children of any age.